Cobble Hill Variety Shop at 495 Henry St. — AKA Omar’s Mailing Mecca — is definitely one of the best businesses in the Carroll Gardens/Cobble Hill area. Why, you ask? Excellent customer service by the owners themselves, and great prices. What more could you ask for. Carroll Gardens doesn’t have a post office, but we have Omar’s mail shop. **Cobble Hill Variety is offering a South Brooklyn Post Holiday Special : Mention South Brooklyn Post for a 25 percent discount on all wrapping, mail preparation, boxes and purchases. The last time Omar offered a SBP special 50 customers went in to redeem it… let’s break that record! Go mail some stuff to Grandma! To Uncle Eddie! Buy some stamps, some wrapping paper, an iPhone cover, some art or mailing or office supplies, some paper clips, make some color copies… get creative! Years later, I moved to Cobble Hill, and had a somewhat similar experience hauling packages to the large post office at Borough Hall, where I waited in line for 40 minutes. I have yet to receive a package in a timely fashion from either post office. They always get lost and I’m always trying to reschedule a delivery with nice, helpful folks on the phone; but still, no packages. Enter Omar Ali’s mail shop, the Cobble Hill Variety, on Henry between Degraw and Sackett. Omar, a father of two little boys who lives in Kensington, opened his shop in the Spring of 2006 with his brother, Suhaib. The shop is pretty cluttered with stuff, yes, and might not display much curb appeal, and may require a walk depending on where you are. But Omar and Suhaib take customer service to the next level—they remember names and faces and get packages boxed up and sent out quickly. Your name will go into their system with frequently used addresses, making shipping easy. The shop mails boxes via FedEx and through the U.S. Postal Service, with a small surcharge, and you can have UPS packages delivered there. They also have printing, in color and black and white, and in almost any size, as well as fax, copy and Internet service. I’ve emailed things to Cobble Hill Variety when my printer was out, to print there, and also scanned things in at the shop. Omar will email the digital file to your personal email. It’s very handy if you work at home and only sometimes need fax, scanning, copying and printing. The charge for service always seems inexpensive, as opposed to some other mail shops, where you can get sticker shock. Omar and Suhaib are there every day, from 9 or 10 to 7 or 8 on weekdays and 10 to 6 on weekends. So you don’t have to worry about packages getting turned away or left on a lonely stoop. 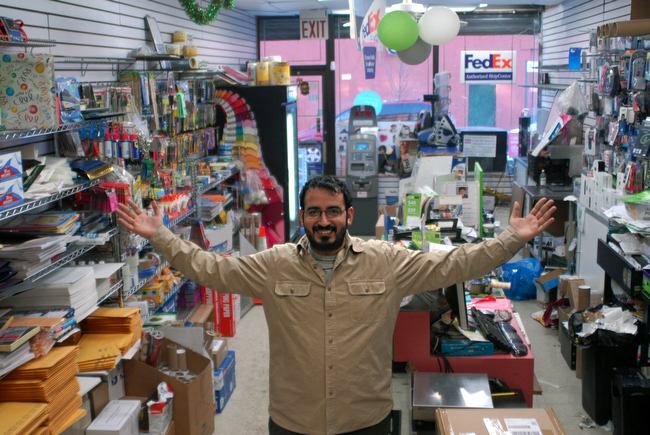 With so many locals working from home, Omar and Suhaib have transitioned the shop into a basic office and mail supply store that also carries Crayola stuff for kids, some stationary and wrapping paper, and lots of cell phone accessories. Omar said he got the idea to open when mail shops on Court closed, and a UPS shop at Court and Atlantic shuttered. His dad owned the convenience store next door, on the corner of Henry and Degraw, since 1992. The mail shop was a video store, and it shut down. Sample fees: $5 for having packages dropped off (less if you do this frequently); Internet, $2 for 5 minutes or $12 per hour; Printing is 11 cents per page for 100 or more pages, 20 cents per page for less than 100 pages. These guys are fantastic and, as a result, I haven’t been to an official post office in years.